The first half was the entrée. A tight first quarter with only the Bulldogs classy forward Sam Willat splitting the middle while the Tribe had been unlucky not to hold a quarter time lead with 4 behinds. 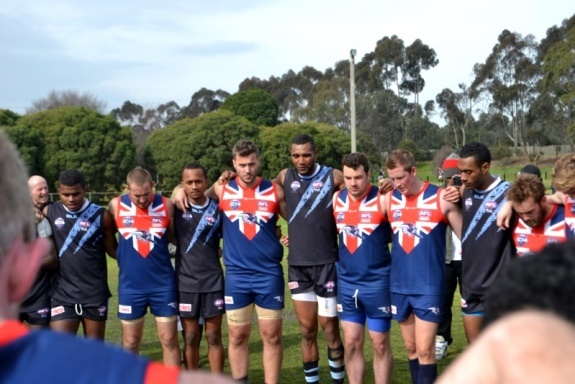 The second quarter was neck and neck as the Brits added 2.3 (again both to Willat) to the Tribe 2.2 and by the half the Bulldogs retained a slender lead 3.3.21 to 2.6.18. The Fiji Tribe came out hard early in the third term quickly registering a goal to take the lead. The ever dangerous and classy #23 Dylan Wolfgramm’s snap around the corner went wide but when the taller #22 Jeffery Pauli adopted the role of front and centre crumber and converted the Tribe had suddenly stamped themselves on the contest. Somewhat reminiscent of Wednesdays clash with Nauru – the Brits would have to dig deep. And once again it was #2 Sam Willat up forward to deliver with a long bouncing rolling snap that just beat the despairing dive on the line to bring the Brits back within a kick. The dagger through the heart late in the third was a near goal speccie to gun utility #11 Filipe Valesu who calmly went back and slotted the goal to give the Tribe a 9 point buffer at the final change. Willat slid in low to mark strongly on the lead to give the Brits an early shot at goal but unfortunately the long shot went just wide. 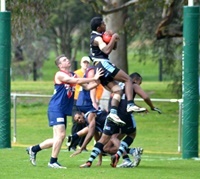 Alas that was perhaps the last real chance as Fiji responded with the only 2 goals of the last quarter. One a ruck infringement perhaps a little harsh on Pitman who was called for throwing when his tap became more of a scoop but could have easily been let go. The Bulldogs were now 20 points off the pace and it would take a minor miracle and alas that wasn’t forthcoming on this day. 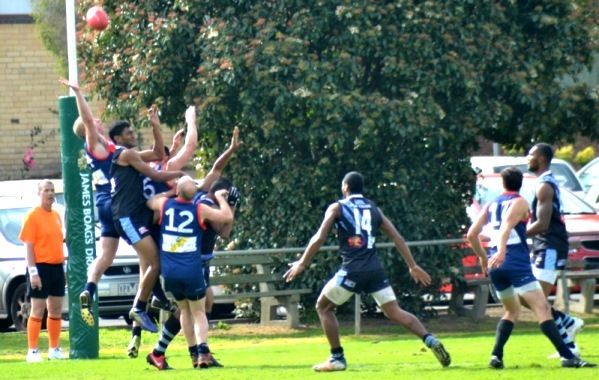 The towel though wasn’t relinquished without a fight and the Bulldogs continued to press but failed to hit the scoreboard meaningfully – finishing with 4 further behinds. While Willat didn’t add to his tally – he displayed his developing talent as he both reads the play and the flight of the ball well and is also super competitive at ground level and often outnumbered is able to keep the ball in. His potential for the Bulldogs is immense. #1 Luke Matias was again a crucial midfield presence both as extractor and distributor and his short rests on the bench had to be carefully managed. At times some of the Bulldogs perhaps can focus too much on a free kick that might have been there and need perhaps to concentrate on playing too the whistle against such quality opposition. After Nauru on Wednesday there was an element of déjà vu about this game for the Bulldogs. But the real déjà vu happens again this Tuesday when the Bulldogs face up again to the Nauru Chiefs. While the Tribe missed out on a top 4 Div 1 finish – they have firmly announced themselves to the International Cup senior ranks as a nation to be very much respected. Their style of footy is super to watch and Tuesday match against the USA will be intriguing by how the Americans strategize to negate the flowing style of the Fijians. However the heady mix of skill and flair is complemented by a capacity for brutal tackling and a general willingness for the physical contest. Footnote : The Manningham Cobras – home club now for Fiji’s Dylan Wolfgramm – were fine hosts and credit is due to both IC sides for remaining after the match to watch the following VAFA match and then party into the evening in again a fine advertisement for the style of bonding that this tournament encourages when done right. Here's an interesting fact about this game. Most of the umpires were Americans. How many "International" umpires are working the games?